Andy Fielding in the Mobichair with Craig Dunning and Fingal Surf Lifesaving Clubs Marty Thompson. Photo by Marian Sampson. 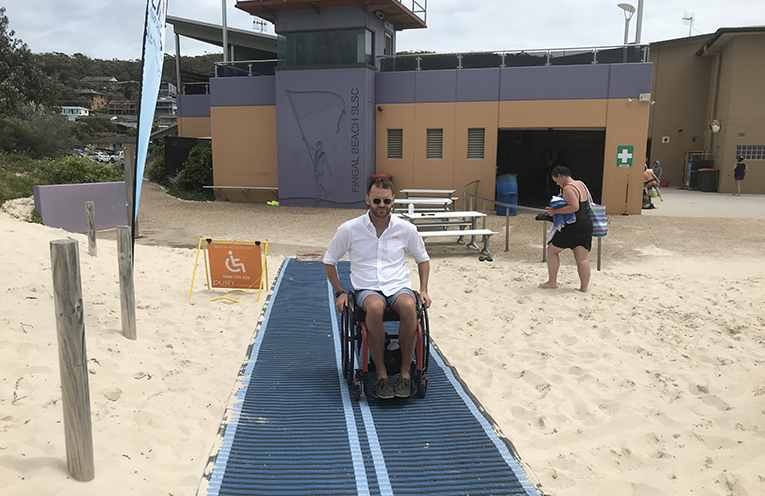 IT was a day for all abilities at Fingal Beach on Sunday with Push Mobility matting making access from the concrete path into the water possible for people of all abilities. Andy Fielding who is blind and has other mobility issues was wheeled down to the water and also took a turn in the mobichair with floatation devices. 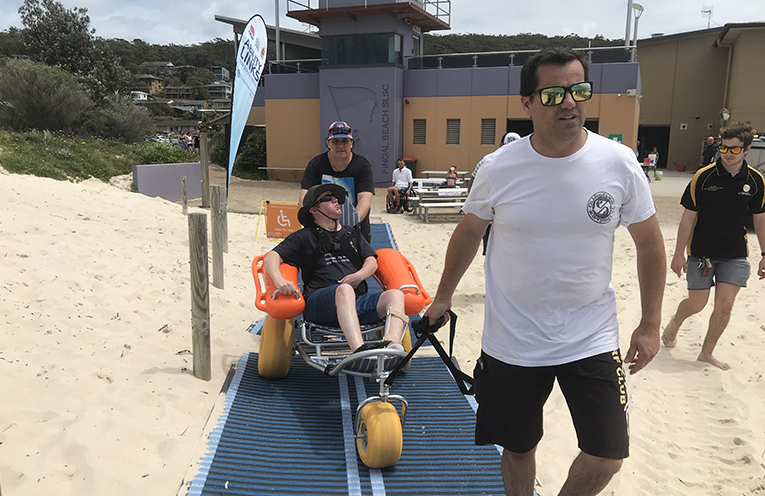 It was two thumbs up for Andy who test drove the new floating wheelchairs recently purchased by Ability Links for Port Stephens beaches. Port Stephens Mayor Ryan Palmer says it’s a fantastic initiative that is being launched in time for the summer beach season. “Our Accessible Beach Day is an opportunity to see these brand new chairs in action! They will soon be available for anyone to use at Fingal, One Mile and Birubi beaches,” he said. Shane Hryhorec of Push Mobility took his wheelchair for a spin down the matting showing how easy it is to navigate on wheels, he also stated that the matting makes getting to the water easier for older residents as well. Permanently adding the matting at Fingal would make the beach truly accessible as the Council facilities already boast a disabled toilet and shower. Shane Heyhorec taking his wheelchair for a spin on the matting which makes it easy to get to the water’s edge. Photo by Marian Sampson.